With herbal extracts and soothing ingredients, this magical gel instantly eases discomfort, and your little one will feel better in minutes. More importantly, this product does not contain medicine, and therefore may be used frequently, without restrictions on dosage. We are confident that this product will help your baby during their teething period, because we have subjected it to independent clinical testing supervised by a medical dentist. It was proven that in 94% of cases, Bebble Teething Gel provides a significant calming effect during the teething period. The study included 34 children with an average age of 7.38 months old. Use of this product over a 7-day period has been proven to alleviate the discomfort associated with teething by 87.45% on average. 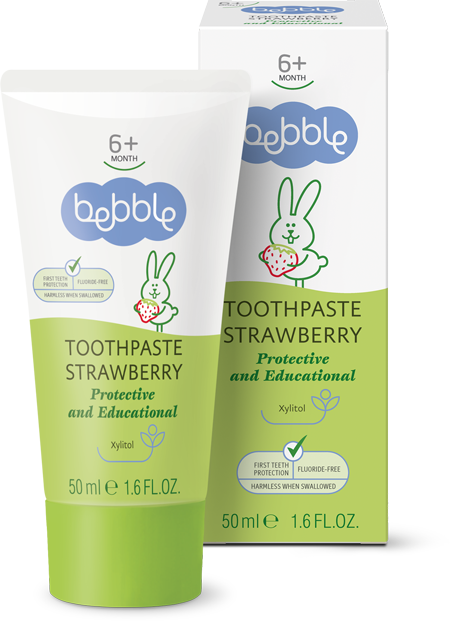 Bebble Teething Gel helps to alleviate redness, swelling, drooling and pain. For best results, this calming gel needs to be gently rubbed onto baby’s gums. You can either use a silicone finger toothbrush or any other soft baby tooth- or gum brush. You might even find it easier to just use your finger (makes sure to wash hands thoroughly first!). Use a pea-sized amount of gel, and carefully rub onto baby’s gums, without applying too much pressure. Your little one will start to feel better from the moment you apply the gel. Repeat when necessary. No need to rinse! Prepare for the arrival of new milk teeth by regularly examining your baby’s mouth. Every week, check your little one’s gums for the tell-tale signs of swelling, redness or small, hard tooth bumps. Rose hip is high in Vitamin C. The fruits of this plant contain many other vitamins such as P, B, E, K and carotene, and are successfully used to tighten the skin and stem bleeding. Rose Hip extract helps to heal wounds, restores cells and stimulates cell-production. With its wonderful aroma, sage plays a key role in the kitchen, but is also commonly known for its wide array of beneficial properties. It has the ability to strengthen the cell defence mechanism and has an antibacterial effect. 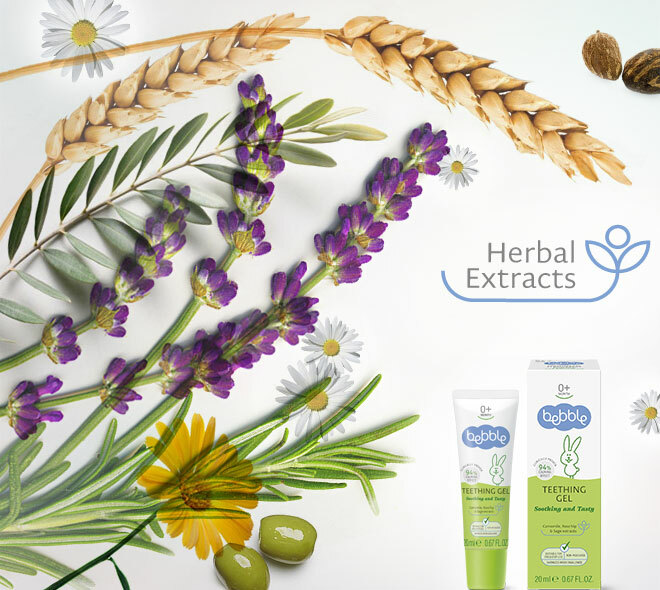 Sage extract has antioxidant, anti-inflammatory and astringent properties, effectively calming and restoring sore or infected skin. The sweetening properties of stevia leaves were discovered over hundreds of years ago, but the stevia plant is also known for its exceptional health benefits; it does not contain calories and is therefore suitable as a dietary supplement. A natural sweetener, stevia balances blood sugar levels and has antifungal and antimicrobial properties.